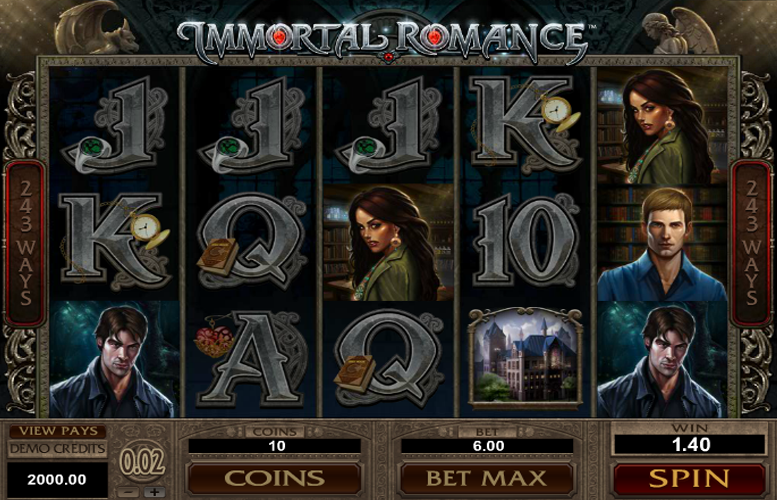 The Immortal Romance slot machine from Microgaming centres around a supernatural love story. If you like vampires and their romantic liaisons with the living, this one might be right up your street. Each of the four characters in the title has been given their own a lengthy backstory. This, combined with the artwork and music, gives the slot a lot of character and a depth not often seen on such machines. There is also a load of great bonuses to boot! Let’s look closer. Great look, sound, and feel. The artwork and soundtrack, along with the subject matter help create a slot machine with a lot of atmosphere. Loads of special features. We love games with so much variation and think Immortal Romance will have a lot of replay value. Attention to detail. Each character is given a full backstory that can be listened to by entering the game options menu. Incredibly weak upper betting limit. We can’t fathom why any slot designer wouldn’t ramp up the maximum possible bet to at least £20! Subject matter won’t appeal to all. It’s a bit like a grown-up Twilight. Just that sentence alone will put some people off immediately! “Scatter” = 200x the total bet. Game Logo = 50x the total bet. Sarah = 16.6x the total bet. Michael = 15x the total bet. Troy = 13.3x the total bet. Amber = 11.6x the total bet. House = 10x the total bet. Old Books = 8.3x the total bet. The Immortal Romance game logo symbol will substitute for all other symbols except the “Scatter”. It also doubles any winning combination it forms. The Wild Desire Feature can occur randomly and turn up to five whole reels “Wild”. 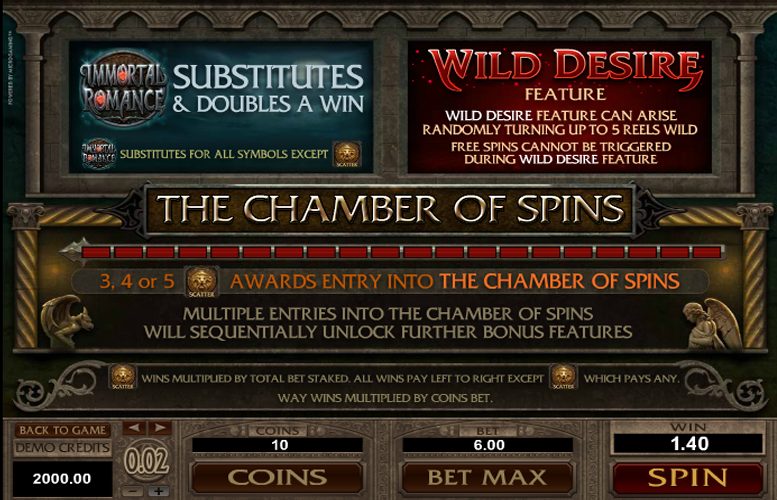 Players should note that free spins cannot be triggered during the Wild Desire Feature. Immortal Romance’s free spins mode is called the Chamber of Spins. Players lucky enough to land three, four, or five “Scatter” symbols will receive entry into this side game. They will also start completing a meter which will unlock further bonus features with each additional entry into the chamber. Each character represents a different one of these free spins rounds. The Amber Free Spins mode gives players 10 free spins with a 5x multiplier. The spins can also be retriggered. This mode is available from the first trigger of the bonus feature. 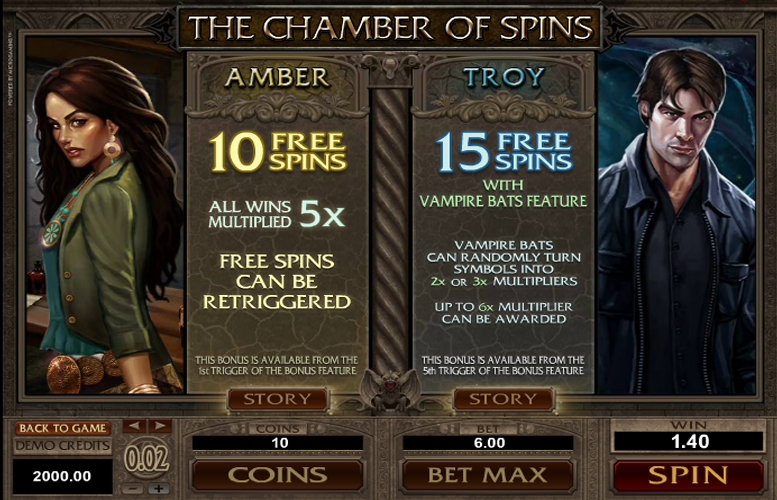 When players have triggered The Chamber of Spins bonus five times, they will unlock the Troy free spins mode. This awards them with a total of 15 free spins with the Vampire Bats feature. The vampire bats can randomly turn symbols into 2x or 3x multipliers. This can eventually lead to a 6x multiplier. 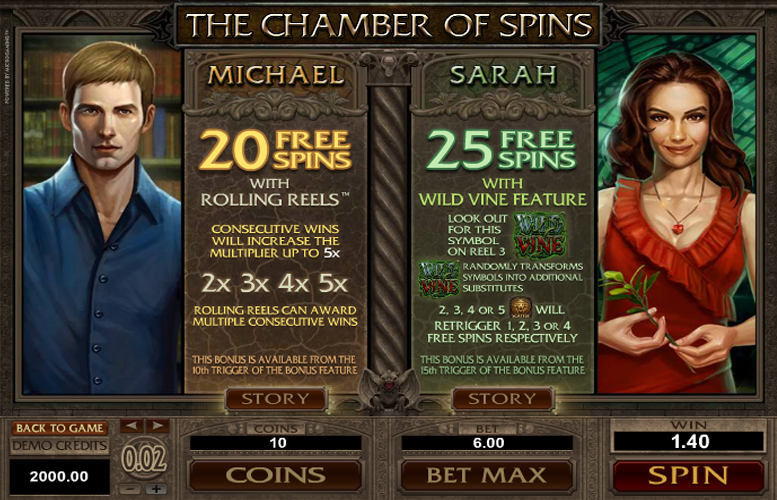 Michael’s Free Spins mode is activated after the tenth time The Chamber of Spins is entered. Players will receive 20 free spins with a Rolling Reels feature. Consecutive wins will increase the multiplier up to a total of 5x. The Rolling Reels can award multiple consecutive wins. The final free spins mode is Sarah’s. This is active from the fifteenth time the bonus feature is triggered. Players will receive 25 free spins with a “Wild” Vine feature. The “Wild” Vine symbol will appear on the third reel and it will randomly transform symbols into additional substitutes. In addition, landing two, three, four, or five “Scatters” will retrigger one, two, three, or four free spins respectively. Ace or King = 5x the total bet. Queen or Jack = 4.16x the total bet. Ten or Nine = 3.3x the total bet. 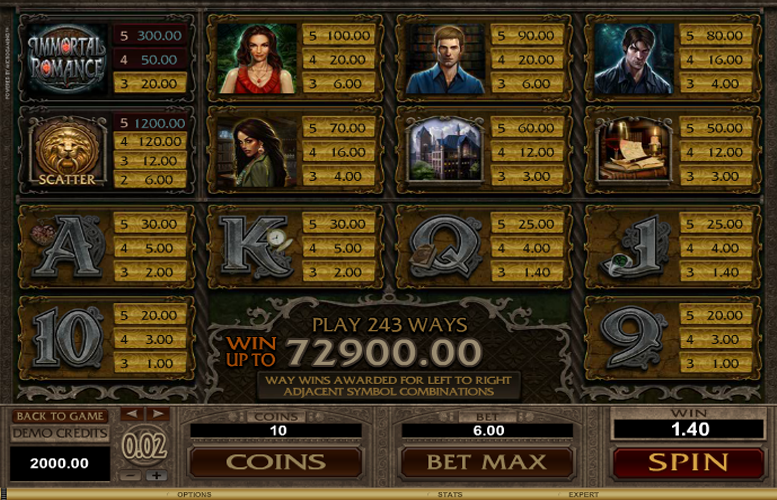 Unlike many Microgaming slots, players are given a lot of control over how they want to distribute their bets on the Immortal Romance slot game. Whilst the number of win lines is fixed at 30, they can adjust the value of each coin bet on them, as well as the number of coins wagered. Players can opt to use coins valued at either 1p or 2p and between one and ten coins per line. With all values set to their minimum, the lowest possible bet per spin is just 30p. Meanwhile, with everything set to the maximum, the highest possible bet per spin is a rather unimpressive £6. Evidently, the Immortal Romance slot machine was not designed for the highest rollers around – or many mid-stakes players for that matter! The Immortal Romance slot machine is sure to divide opinion. Some will dismiss it entirely based on its subject matter. This is a shame since the game itself looks, sounds, and plays great. The visuals have been excellently illustrated and the game features complement the theme excellently. Fans of the Twilight series are sure to love this one. Otherwise, anyone who likes a well-designed machine will also likely enjoy a spin or two on the Immortal Romance slot. This game has a rating of 4 / 5 with 716 total reviews by the users.